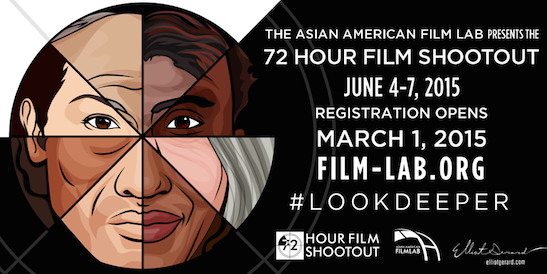 The Asian American Film Lab is presenting the 11th annual 72 Hour Shootout™ (“Shootout”) filmmaking competition, June 4-7, 2015. It’s time to register at www.asianamericanfilmlab.com! Ms. Youn Jung Kim has been named the 72 Hour Shootout Coordinator of 2015, and will be the first female coordinator in Shootout history! The Shootout is a worldwide competition, celebrating diversity and artistic self empowerment, in which filmmaking teams are given a common theme at the start and then have 72 hours to write, shoot, edit, and complete short films up to five minutes in length. Teams compete for cash and prizes, as well as the chance to have their films screened at the prestigious Asian American International Film Festival, organized by Asian CineVision, the only festival of its kind on the East Coast, and at the Asians on Film Festival in Los Angeles, California, and, for the first time ever, at the acclaimed New York Indian Film Festival, now in its 15th year. Competitors will also compete for televised broadcast on the Film Lab series, Film Lab Presents and on AAFL TV! 2015 judges include ABC’s Marci Phillips, playwright David Henry Hwang, the famous stuntman Lane Leavitt, producer Bertha Bay-Sa Pan, film festival programmer Scott Eriksson, talent agent David Elliott, and producer Aseem Chhabra, among others! Both ABC and NBC will be providing mentorship prizes! The Shootout is intended to create opportunities for women and filmmakers of color, with a focus on Asian Americans, to demonstrate their talent, help them gain exposure in the entertainment industry, and impact the visibility of diverse stories and characters in film and television. One of the Shootout requirements is that at least one key production member (e.g., director, producer, or writer) and a principal actor from each team must be of Asian descent. As recent reports from SAG show, Asian Americans are the only racial group whose representation on network television has actually declined over the past year, even as their population increases. Youn Jung Kim is a New-York based multidisciplinary artist with an MFA in theater from Sarah Lawrence College and a BA in theater and drama from University of Wisconsin-Madison. A director and editor, she specializes in the creation of original works integrating mixed media. Her recent directing work, multimedia-music-martial arts ballet “The Sweet Science Suite: A Scientific Soul Music Honoring of Muhammad Ali” was seen by the public at 2013 BAM Next Wave Festival. Kim is a member of Basic Engineering Collective, a multidisciplinary theatre group and co-creator of “The Gathering.” Kim has also worked at La MaMa, Pan Asian Repertory Theater, Paradise Factory Theater, and more. Stage manager credits include “Deadly She-Wolf Assassin at Armageddon!” at La MaMa. 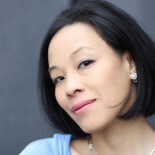 As a vocalist, she had the honor of working with acclaimed and celebrated Asian American composer Fred Ho. Kim’s other work has been featured at “Mirror of the Soul: Portraits by Leah Poller” at Knox Gallery in Harlem. Her Shootout promotional piece “LOOK DEEPER: Beauty,” which she co-wrote and directed, is now available on AAFL TV and the 72 Hour Shootout online channel at http://youtu.be/PuOen02ZewQ. In connection with the Shootout, the Film Lab will be hosting several pre-launch events including an interactive filmmaking how-to workshop to teach first-time and veteran filmmakers alike how to create their best possible film within 72 hours, a workshop with NBC and a team-building and networking event to help Shootout registrants put their Shootout teams together. For further information about the Film Lab and the Shootout, including viewing past winning films, please visit us www.film-lab.org or email Shootout Coordinator, Youn Jung Kim, at Shootout@film-lab.org. For free access to videos and updates, subscribe at www.youtube.com/asamfilmlab. Filmmakers can also network on the Shootout Fan Page (www.Facebook.com/72HourShootout)! For photos of the West Coast Shootout premiere, visit https://www.facebook.com/media/set/?set=a.10200600485574259.1073741848.1823087136&type=1&l=f15c064dac. The Asian American Film Lab (Film Lab) is a 501(c)(3) non-profit dedicated to the promotion and support of gender and ethnic diversity in film and television through free monthly educational and outreach programming and the acclaimed annual 72 Hour Shootout filmmaking competition (www.asianamericanfilmlab.org). This annual competition has inspired hundreds of filmmakers by helping nascent talent take brave steps towards a filmmaking career. The Film Lab was formed in 1998 by collaborative of New York-based filmmakers whose goals were to hone their craft and to share their knowledge, experience and resources. The membership has grown to comprise professionals, artists and other talented individuals who all share the common goal of creating great film and promoting all filmmakers of color, with a focus on Asian Americans, and the visibility of their stories and characters in film and television. The Film Lab is run under the direction of President Jennifer Betit Yen. Acting and Advisory Board members include Aaron Woolfolk and Edwin Wong, among others. For a complete list of staff and management, please visit www.film-lab.org. The Film Lab is a 501(c)(3) not-for-profit organization. Membership and all contributions are tax-deductible to the fullest extent of the law. Click here for other film articles. This entry was posted on March 2, 2015 by Lia Chang in Asian American Artists, Asian American Issues, Asian American Pioneers, Entertainment, Film, New York and tagged 11th annual 72 Hour Shootout™, AAFL TV, Aseem Chhabra, Asian American International Film Festival, Asian CineVision, Asians on Film Festival, Backstage Pass with Lia Chang, Bertha Bay-Sa Pan, David Elliott, David Henry Hwang, Film Lab, Film Lab Presents, filmmaking competition, Lane Leavitt, Lia Chang, Marci Phillips, New York Indian Film Festival, Scott Eriksson, The Asian American Film Lab, Youn Jung Kim.